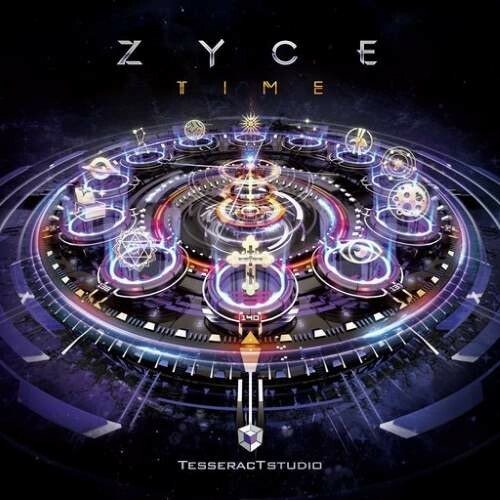 TesseracTstudio is honored to celebrate 10 years of project Zyce by presenting a remarkable 6th studio album called 'Time', which took Zyce more than 2 years or 730 days or 43.800 minutes or 2.628.000 seconds to create. But, what is time? Is it what clock measures? Can you see it, can you feel it? How do we know that time really exists? Does time have a beginning and an end? Is it a straight line or a circle? Is it real or unreal? All living beings except humans live in a continual present, with no sense of the temporal distinctions of past, present and future. Consciousness of time is therefore one of the most important distinguishing features of humankind. But, humans need predictable, regular, cyclic behavior in order to measure time. Clock. Clock ticks. It counts the events that occur at regular intervals, during the day and night. The second is a base unit of time. A Minute is 60 seconds. Hour is 60 minutes or 3600 seconds. A Day is 24 hours or 1.440 minutes or 86.400 seconds. A Year is 365 days or 8.760 hours or 525.600 minutes or 31.536.000 seconds. And every second counts. Each moment in past, present or future. Each memory. Each experience. Every feeling. Time is an imminent part of our lives and as Charles Darwin said: 'A man who dares to waste one hour of time has not discovered the value of life'. Said that, Zyce has used clock as a main concept to measure and represent his album 'Time', creating 12 tracks that symbolize clock. And, as the clock ticks, Zyce takes us on a musical journey through 'Time' in hours, minutes and seconds, all the way from night to day, from melancholic to uplifting, from past to future. And to design such complex journey, besides 5 solo tracks, Zyce created special intro and outro and collaborated with prominent psytrance projects such as Liquid Soul, Ticon, Waio, Sonic Species, Static Movement and Solar Kid. Sit back, relax and let the Zyce be your clock and measure your 'Time'.